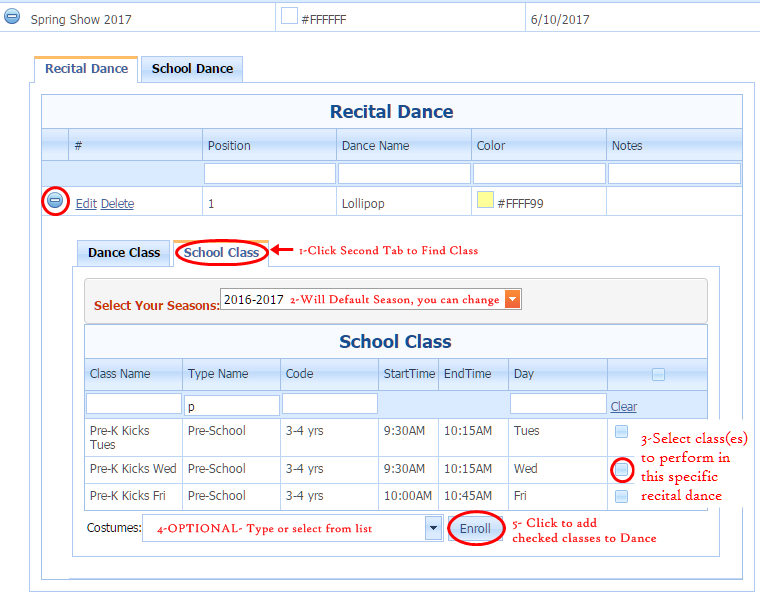 In this section you will be able to add and order your dances, link the classes to the dances they are performing in and link or unlink students to the specific dance in the assigned class. You can also set the costumes to be worn for the dance by the class or individual student. Costume sizes may also be specified for this specific dance costume. You will first need to add the Recital and Dances in the admin section. Then in Manage Recital you will see your Recitals listed. Click the plus or arrow to open. The first tab, Recital Dance, will show the Dances already linked to this recital. Click the second tab, School Dances, Will list all of the dances that are not currently linked in this recital so that you can link them. Check on the right side, the dances you want performed in that recital. Then click the button. You can link multiple selections at once. You can always delete them later if changed or added in error. *If you do not want to see previous recital information, you can ask us to remove the recitals, dances and costumes that were previously created. To Enroll a class to perform a specific Dance – click the to expand the details of the dance. The first tab will show any classes already linked to perform the dance. You can have more than 1 class in the same dance. The second tab will list the Classes in your school who are not already linked so you can select them. The season will default to your default season. You can change it to select other season classes. On the right side, select the classes to perform. You may filter to find them. At the bottom, you can assign a Costume for this class to wear for the dance. You can also edit or add them to the individuals. To select the costume you may type the Description name or use the drop down arrow to select from the list. Costume will need to be entered in the Recital Admin-Costume Tab before being assigned.